Similar to our previous efforts, we will define ZOROBABEL [1-81] as representing both of the above lineages... but in this case, with a heavier emphasis on the Nathan line. 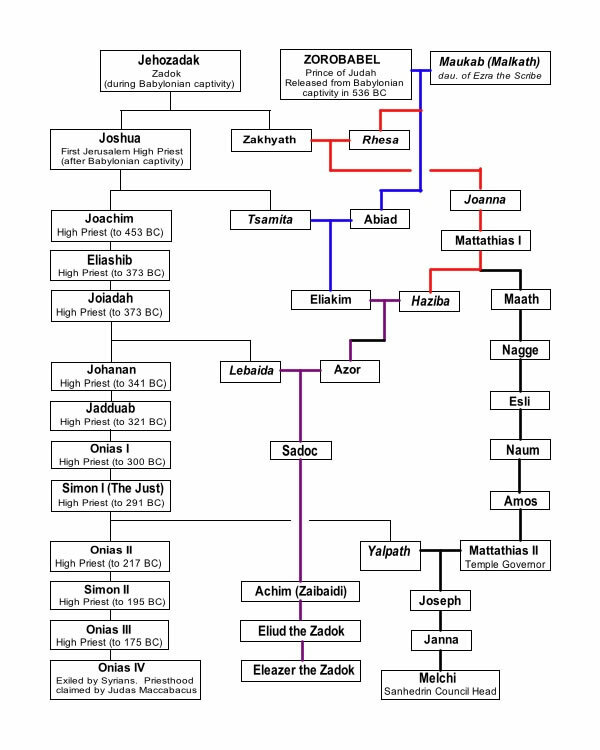 The implication is that while King David can be claimed as an ancestor by any of Zorobabbel’s descendents, it is less certain if King Solomon and his line of kings of Judah -- who were as often in the doghouse of the Hebrew god as in his temple dedicated to his worship -- can also be claimed... that is, at least by the family trees available here. On the other hand, with Jechoniah having seven children, it seems likely that alternatives existed for a modern descendant who wants to claim some kind of tortured path back to King Solomon. As they say... where there’s a will; there’s a way... and/or a legal action. For example Figure 1 (and further below, Figure 2) includes descendents from the Zadok, Jehozadak, who undoubtedly could also claim descent from royalty (or at least, aristocratic lines... including those of Cain and/or Seth. It is also noteworthy that Jehozadak’s line of High Priests of Jerusalem recombined with the royal line at least six times, and also created a line of of High Priests that led to the Hasmonaean House of the Maccabees (and to Mary Magdalene). According to Wikipedia, Zerubbabel had been determined to be among the wisest men in Persia. To this end, he took up the challenge of presenting to Cyrus, King of Persia, a dissertation on women and truth [I’d love to see that one!]. Thereafter, he was allowed to lead the first band of Jews, numbering 42,360, in returning from the Babylonian Captivity to Judah. He had also been given sanction to rebuild the Temple and return the sacred Temple vessels that Darius had preserved after the conquest of Babylon. He is thereafter credited with laying the foundation of the Second Temple in Jerusalem the year after their return He was likely responsible for the recovery of the Torah and the Books of the Prophets (and not Ezra). Zerubbabel achieved legendary status in Post-Exilic times, and is mentioned among the famous men of Israel [Who’s Who in Where ever]. He is announced as the Prince of Judah upon his return to the Holy Land. Zerubbabel is one of the firm and long-standing followers and friends of the Prophet Isaiah, and a descendant of the Davidic Dynasty. Rhesa’s brother, Abiad, provides a separate royal line through Eliakim, the latter who marries Haziba (the sister of Maath from the Rhesa line). Eliakim and Haziba then begin the royal line leading to the Zadoks, and thence to such luminaries as John the Baptist, Hannah, Salome, Anna (who marries James, the brother of Jesus), and of course Mary (the mother of Jesus). As it turns out, this same line of Zadoks also leads to Joseph as well. [Abiad may be identified in Wikipedia as either: Meshullam, who succeeded Zerubbabel as Exilarch, and/or a second son, Hananiah.] This line of descent will henceforth be referred to as “the Mary line”. A third important line is Jehozadak, the Zadok during the Babylonian captivity. This leads to a lineage of High Priests, a line that is ultimately claimed by Judas Maccabacus. The ascent of the Hasmonaean House of the Maccabees will ultimately lead to Hezekiah, which then contributes to one line involving the same luminaries as in the Mary line above (John the Baptist, Hannah, Salome, Anna, Mary, and Joseph), as well as an important second line that will yield on the one hand, Martha and Simon Magus (aka Lazarus), and on the other Mary Magdalene. The Genealogy from Zerubbabel to Mary and Joseph is fraught with difficulties. For a degree of consistency, we will be using Laurence Gardner’s The Magdalene Legacy, and one of his tables of genealogy -- specifically, “Bloodline of the Holy Grail; Ancestors and Descendants of Jesus from King David to King Arthur” (page 337-338) as one means of describing the Descendants of Zerubbabel. But we will also use Wikipedia’s Genealogy of Jesus web page (which is presented in part, following the recitation of Generations below). Note in particular that according to Wikipedia that there are differences between the Gospels of Luke and Matthew and both with Gardner. Furthermore, very little is known about the intervening ancestors/descendants, other than that of their alleged lineage. Just to give some idea of the problem, there are, according to Matthew, nine (9) generations between Zerubbabel and Joseph, while according to Luke, there are twice as many -- eighteen (18). Gardner, on the other hand provides an important addition, particularly in connecting the links between Mary and Joseph’s lines. Note: Tsamita’s brother, Joachim began a line of High Priests of Jerusalem, extending down through Eliashib, Joiadah, Johanan, Jadduah, Onias I, Simon I (the Just), Onias II, Simon II, Onias III, and Onias IV. The High Priesthood was claimed (c. 170 BC) by the Hasmonaean House of the Maccabees -- whose line extended from Mattathias of Modin, to Simon Macabaeus (Prince-Priest), John Hycanus I, Hezekiah, Judas of Gamia (chief scribe), Menahem the Essene (Isaac Patriarch and founder of West Manasseh Magians AD 44), and thence to both Simon Magus (Lazarus) and Eucharia, the latter the mother of Mary Magdalene. 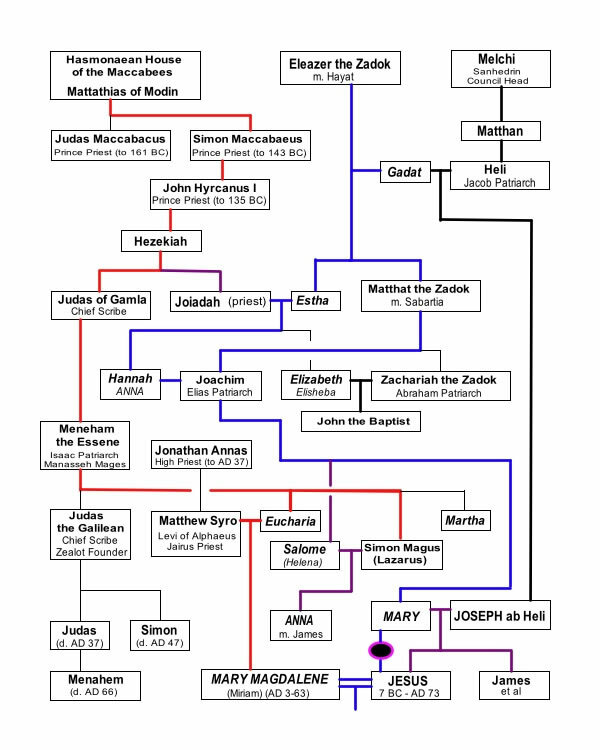 According to Wikipedia and/or Luke -- there may be a Levi between Melchi and Matthat; see below, the Genealogy of Jesus. According to New Advent, Hannah (Anna, Anne, Ann) is the traditional name of the mother of Mary (mother of Jesus). Otherwise, all information concerning the names and lives of Joachim and Anne, the parents of Mary, is derived from apocryphal literature [those books not endorsed by the Catholic Church, and thus clearly important]. This literature included the Gospel of the Nativity of Mary, the Gospel of Pseudo-Matthew and the Protoevangelium of James. In the Orient the Protoevangelium had great authority and portions of it were read on the feasts of Mary by the Greeks, Syrians, Copts, and Arabians. In the Occident, it was rejected by the Fathers of the Church until its contents were incorporated by Jacobus de Voragine in his "Golden Legend" in the 13th century. From that time on the story of St. Anne spread over the West and was amply developed, until St. Anne became one of the most popular saints of the Latin Church... in addition to her popularity in the Orient. The Protoevangelium gives the following account: In Nazareth there lived a rich and pious couple, Joachim and Hannah. They were childless. When on a feast day, Joachim presented himself to offer sacrifice in the temple, he was repulsed by a certain Ruben, under the pretext that men without offspring were unworthy to be admitted. [Perhaps just a bit of adding insult to injury?] Whereupon Joachim, bowed down with grief, did not return home, but went into the mountains to make his plaint to God in solitude. Also Hannah, having learned the reason of the prolonged absence of her husband, cried to the Lord to take away from her the curse of sterility, promising to dedicate her child to the service of God. [One thing about Abraham’s descendants, they don’t hesitate to improve their own lives, by doing any and everything to their children.] Their prayers were heard; an angel came to Hannah and said: "Hannah, the Lord has looked upon thy tears; thou shalt conceive and give birth and the fruit of thy womb shall be blessed by all the world". The angel made the same promise to Joachim, who returned to his wife. Hannah gave birth to a daughter whom she called Miriam (Mary). Since this story is apparently a reproduction of the biblical account of the conception of Samuel, whose mother was also called Hannah, even the name of the mother of Mary seems to be doubtful. The renowned Father John of Eck of Ingolstadt, in a sermon on St. Anne (published at Paris in 1579), pretends to know even the names of the parents of St. Anne. He calls them Stollanus and Emerentia. He says that St. Anne was born after Stollanus and Emerentia had been childless for twenty years; that St. Joachim died soon after the presentation of Mary in the temple; that St. Anne then married Cleophas, by whom she became the mother of Mary Cleophae (the wife of Alphaeus and mother of the Apostles James the Lesser, Simon and Judas, and of Joseph the Just); after the death of Cleophas she is said to have married Salomas, to whom she bore Maria Salomae (the wife of Zebedaeus and mother of the Apostles John and James the Greater). [Between Anne and Joachim, apparently Anne was not one with reproductive problems.] The same spurious legend is found in many other writings. There arose in the sixteenth century an animated controversy over the marriages of St. Anne, in which Baronius and Bellarmine defended her monogamy. The Greek Menaea call the parents of St. Anne: Mathan and Maria, and relate that Salome and Elizabeth, the mother of St. John the Baptist, were daughters of two sisters of St. Anne. According to Ephiphanius it was maintained even in the fourth century by some enthusiasts that St. Anne conceived without the action of man. This alleged error was revived in the West in the fifteenth century in the form of the Anna concepit per osculum Joachimi. In 1677 the Holy See condemned the error of Imperial who taught that St. Anne in the conception and birth of Mary remained virgin (Benedict XIV). [The church giveth and the church taketh away. For example...] in the Orient the cult of St. Anne can be traced to the fourth century AD when Justinian I had a church dedicated to her. Her feast is celebrated in the East on the 25th day of July, which may be the day of the dedication of her first church at Constantinople or the anniversary of the arrival of her supposed relics in Constantinople (710). The Greeks keep a collective feast of St. Joachim and St. Anne on the 9th of September. In the Latin Church. St. Anne was not venerated, except, perhaps, in the south of France, before the thirteenth century. Her feast, under the influence of the "Golden Legend", is first found in the thirteenth century, where a foot of St. Anne was venerated (feast of translation). It was introduced in England by Urban VI (21 November, 1378), from which time it spread all over the Western Church. It was extended to the universal Latin Church in 1584. The head of St. Anne was kept at Mainz up to 1510 [charming! ], when it was stolen and brought to Düren in Rheinland. St. Anne is the patroness of Brittany. In Canada, she is the principal patron of the province of Quebec. St. Anne is patroness of women in labor; she is represented holding the Blessed Virgin Mary in her lap, who again carries on her arm the child Jesus. She is also patroness of miners, Christ being compared to gold, Mary to silver. * She was a prophetess. * She was a daughter of Phanuel. * She was a member of the tribe of Asher. * She was widowed after seven years of marriage (her husband was not named). * She was a devout Jew who regularly practiced prayer and fasting. The Eastern Orthodox Church (as well as Roman Catholic Church) commemorates Anna as a saint, Anna the Prophetess. The Eastern Orthodox Church consider Anna and Simeon the God-Receiver as the last prophets of Old Testament and observes their feast on February 3/February 16 as the synaxis (afterfeast) following the Presentation of Christ. Her figure is also drawn in the icons of the Presentation of Christ, together with the Holy Child and the Virgin Mary, Joseph and Simeon the God-Receiver. Orthodox tradition considers that Christ met his people, Israel, in the persons of those two, Simeon and Anna. Anna is often placed behind Mary. Anna either raises her hands to Christ, to show people him as Christ, or hands a scroll which is attributed often to prophets in Orthodox iconography. There's not a lot about Heli... suggesting that in marrying Anna, he was "marrying up". Mary was, according to tradition, a Jewish woman of Nazareth in Galilee, identified in the New Testament as the mother of Jesus of Nazareth [despite the minor fact that Nazareth probably did not exist until centuries later]. The New Testament describes her as a virgin (Greek parthénos) – who conceived her son miraculously by the agency of the Holy Spirit. This took place when she was already the betrothed wife of Joseph ab Heli and was awaiting the concluding rite of Jewish marriage, the formal home-taking ceremony. As mentioned in the Genealogy of Jesus (included in the following web page), and in the context of the Descendants of Tiamat, one might suspect Enki (or someone of his ilk) as being responsible for Mary’s condition. It’s entirely possible that gods might be given a lot of latitude in their dealings with humans. Furthermore, early non-biblical writings state that Mary was the daughter of Joachim (the Elias Patriarch) and Hannah (Anna) -- both of whom were descended from Eleazer the Zadok (and Hayat). Thus, they are direct descendants of Zorobabbel, Prince of Judah, and thus from David, King of Judah and Israel. Joseph ab Heli was the son of Heli, the Jacob Patriarch, and Gadat (the latter, a daughter of Eleazer the Zadok and Hayat. Eleazer and Hayat were also grandparents of Mary; thus making Mary and Joseph first cousins [apparently kissing cousins, if their 7 or 8 children are any indication]. This also implies that both were descended from Zorobabbel, Prince of Judah, and thus from David, King of Judah and Israel. In this manner, both Mary and Joseph were of the House of David. In general... accounts of Mary’s and Joseph’s lives are so interwoven with severely limited, canonical religious views (from Catholics to Orthodox to Muslims to Protestants to Jews to secular sources) as to make the truth of their lives, even that of their children, a matter of intense debate. The more rational (as opposed to blind faith) view might be best characterized by Laurence Gardner’s several books on the subject, ranging from Bloodline of the Holy Grail, Genesis of the Grail Kings, and The Magdalene Legacy. Also, Holy Blood, Holy Grail by Michael Baigent, Richard Leigh, and Henry Lincoln, might be able to shed a great deal of light on the subject. For purposes of genealogy, however, the primary assertion herein is that Mary and Joseph were ostensibly descended from King David, and through at least two of their children (Jesus and James) had descendants extending to the present day, a huge percentage of which had “royal blood” (aka Sangre Royal). In fact, kings often claimed and made a big deal about their lineage -- particularly when it was one extending back to Mary and Joseph -- as a means of making their reign legitimate and ostensibly... divinely inspired. What is extraordinary is the number of people who've bought the "divine rule" scenario. Gardner, et al, note that Mary and Joseph were members of the Essenes and lived in Qumran (see Mary Magdalene and Jesus). Accordingly, their lives and marriage were dictated by the orthodox doctrine of the Essenes. The latter placed great emphasis on the birth of children and royal heirs (both Mary and Joseph allegedly being descended from royalty... aka King David, et al). This is described in some detail by Gardner’s Bloodline of the Holy Grail. The latter also makes it clear that the same traditions were strictly applied to the marriage of Jesus and Mary Magdalene, and in effect explain so many aspects of their lives... but aspects which have been routinely and intentionally misinterpreted by the hierarchy of the Roman Catholic Church. Sorry, but this is not the bit about the notorious Dance of the Seven Veils, the beheading of John the Baptist, or the necrophiliac. That’s another Salome, a flirty girl just out to have some fun (and create the meat of future Hollywood epics). There are in fact, five other Salomes of the period, including: Salome Alexandra (Queen of Judea, 76-67 BCE), Salome I (Herod the Great’s sister), Salome (daughter of Herod I), Sarah-Salome (sister of Jesus), and Salome (disciple) [aka Helena-Salome] -- the latter sometimes called Saint Mary Salome. Part of the latter's claim to fame is that she was present at the crucifixion of Jesus, was the mother of James and John, two of the Apostles of Jesus, and in line with the genealogical aspects, Salome should be better known as Mary’s sister. Her husband, on the other hand, is the uncle of Mary Magdalene. These close family ties continue the royal tradition, where he or she with the greatest percentage and purest blue blood are the winners. Salome might of as easily been the “blessed virgin mary” (BVM) as Mary... except she would have become the “BVS”. Mark 15:40: "There were also women looking on afar off: among whom was Mary Magdalene, and Mary the mother of James the less and of Joses, and Salome.” [Incidentally, Mark 6:3 specifically identifies Jesus as the son of Mary and brother of James, Joses, Judas and Simon. Clearly, Jesus was not an only child... even according to the Canonical Gospels. (Also James the Less is sometimes identified with James the Just -- see below.)] In Matthew, Salome is called the mother of Zebedee’s children. Zebedee was, according to Wikipedia, a Hebrew fisherman [who apparently got really, really lucky and married into royalty]. Salome is also among the women who find the stone rolled away from Jesus’ tomb (mentioned in both Mark and Matthew -- although she is not unambiguously identified in the latter). The canonical gospels never label Salome a “disciple”, and accordingly mainstream Christian writers usually refer to her as a “follower” of Jesus. The early gnostic Gospel of Thomas, however, includes Salome and Mary Magdalene as disciples, and reports on a conversation between Jesus and Salome, when Jesus is sharing Salome’s couch at a meal: “'Who are you sir,' she asks him, 'that you have taken your place on my couch and eaten from my table?' And Jesus says, "I am he who is from the One, and the things that belong to the Father have been given to me." Salome replies, "But I am your disciple", and Jesus answers, "When the disciple is united he will be filled with light, but if he is divided he will be filled with darkness." "And the midwife went out from the cave, and Salome met her. And the midwife said to her, "Salome, Salome, I will tell you a most surprising thing, which I saw. A virgin has brought forth, which is a thing contrary to nature." To which Salome replied, "As the Lord my God lives, unless I receive particular proof of this matter, I will not believe that a virgin has brought forth." “Then Salome went in, and the midwife said, "Mary, show yourself, for a great controversy has arisen about you." And Salome tested her with her finger. But her hand was withered, and she groaned bitterly, and said, "Woe to me, because of my iniquity! For I have tempted the living God, and my hand is ready to drop off." That Salome is the first, after the midwife, to bear witness to the Miraculous Birth and to recognize Jesus as the Christ, are circumstances that tend to connect her with Salome the disciple. Lazarus was, according to Wikipedia, the key figure in chapter 11 of the Gospel of John. He is introduced as a follower of Jesus, as well as the brother of the sisters Mary and Martha. The story goes that: the sisters send word to Jesus that Lazarus, "he whom thou lovest," is ill. Instead of immediately traveling to Bethany, according to the narrator, Jesus intentionally remains where he is for two more days before beginning the journey. When Jesus finally arrives in Bethany, he finds that Lazarus is dead and has already been in his tomb for four days. He meets first with Martha and Mary in turn. Martha laments that Jesus did not arrive soon enough to heal her brother and Jesus replies with the well-known statement, "I am the resurrection, and the life: he that believeth in me, though he were dead, yet shall he live: And whosoever liveth and believeth in me shall never die". [Which is quite a fringe benefit for true believers!] Next encountering Mary, Jesus is moved by her sorrow. The narrator here gives the famous simple phrase, "Jesus wept". This clue about Lazarus not being Mr. Popularity is resolved somewhat in Laurence Gardner’s treatment of the Biblical story. “Under Jewish law, outlary was a form of death by decree -- the spiritual execution of a social outcast (akin to excommunication), and was figuratively referred to as “death’. [Astounding how religions think that exiling someone from their religion is bad news.] “However, [this social death] took four days for complete implementation. In the meantime, the excommunicatee was stripped, wrapped in a shroud, shut away, and held to be ‘sick unto death’. In the case of Lazarus Martha and Mary knew that his soul would be forever condemned if he was not reprieved (raised) by the third day, and so they sent word to Jesus that Simon was ‘sick’. Finally, Laurence Gardner, in his book The Magdalene Legacy, names Helena-Salome as the wife of Simon-Zelotes (Lazarus). (page 174). “In the world of religious fine art, there are numerous portrayals of Mary Magdalene in Provence [France].” The accounts agree that the leader of the Provencal mission was Simon Zelotes, who became known as Lazarus the Great One (Maximus). “It was he who eventually laid the Magdalene to rest in her alabaster sepulcher at the Chapel of St Maximum in AD 63.” Lazarus was “the most senior of Jesus’ apostles”, “a patriarchal father of the Qumran community, [and] a member of Jesus’s own family. This and the following generation (No. 100) are in many respects the culmination and focus of 90 to a hundred some odd begats, leading to four primary characters in the 99th congress, so to speak, and subsequently four primary characters in the 100th. These eight people, more than any one else, represent the core cadre of the Despoyni. The terms means “Heirs of the Lord”, and is reserved uniquely for Jesus’ blood relatives, i.e., “only those persons in the bloodline with Jesus through his mother qualified as Desposyni.” [Gardner, The Magdalene Legacy, page 20] In effect, the Desposyni could also include as their critical ancestor, god (aka Enki). But prior to taking on the 100th generation and its many descendants, we will digress into the Genealogy of Jesus, according to the scriptures, and thereafter a wholly new tact from roughly 750 BCE, in which the Roman contingent makes its presence known... and amazingly enough contributes to the Mary Magdalene, Jesus, James, and Anna heritage.